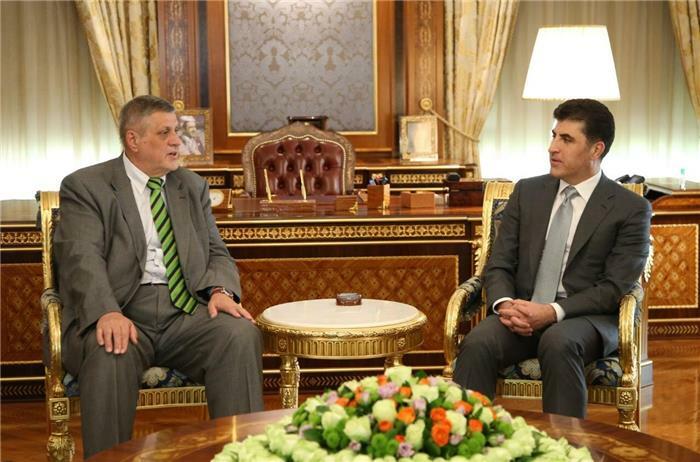 Erbil, Kurdistan Region, Iraq (cabinet.gov.krd) – Prime Minister Nechirvan Barzani met with UN Secretary General’s Special Representative to Iraq, Jan Kubis, and his accompanying delegation. In the meeting, both sides discussed post-referendum developments, reactions and the sanctions that the Baghdad authorities imposed on the Kurdistan Region, that included banning international flights to and from both Erbil and Slemani International Airports. 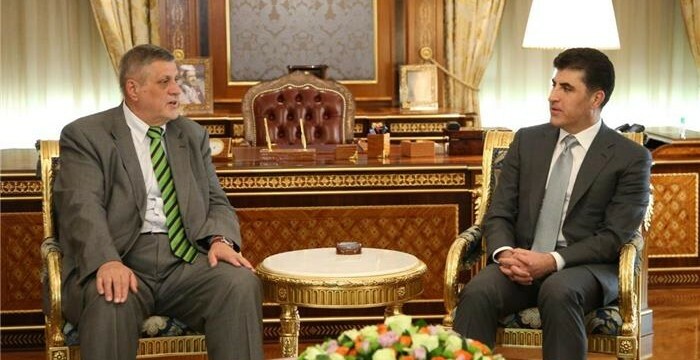 Prime Minister Barzani reiterated his government’s position which is resolving all the issues with Baghdad through dialogue and negotiations, pointing out to the important role the United Nations can play in this process. He emphasized that the Kurdistan Region is with de-escalating the tension with Baghdad and is against any step that may further exacerbates the situation. Kurdistan Region Prime Minister emphasized that the referendum did not constitute a threat against any country, because the Kurdistan Region has always been and will stay a factor of peace and stability in the region. He also stressed that the Kurdistan Region will stay committed to fight the terrorists of ISIS and supporting the IDPs and Refugees that the Kurdistan Region is hosting. He boasted that the protection of all ethnic and religious Components of the Kurdistan Region has always been and will stay part of the culture and policy of the KRG.